Grammar tips: Commas Grammar tips: Commas - HGR Inc.
A comma is often the most misused punctuation mark. When we don’t know where they belong, we tend to leave them out or stick them in sentences where they shouldn’t go. Here’s the down and dirty on commas and some quick tips to help you out. With examples, of course! Did you know the presence or absence of a comma can change the meaning of the sentence? We’re going to learn to cut and paste kids should be We’re going to learn to cut and paste, kids. We order merchandise and sell products OR We order, merchandise and sell products. 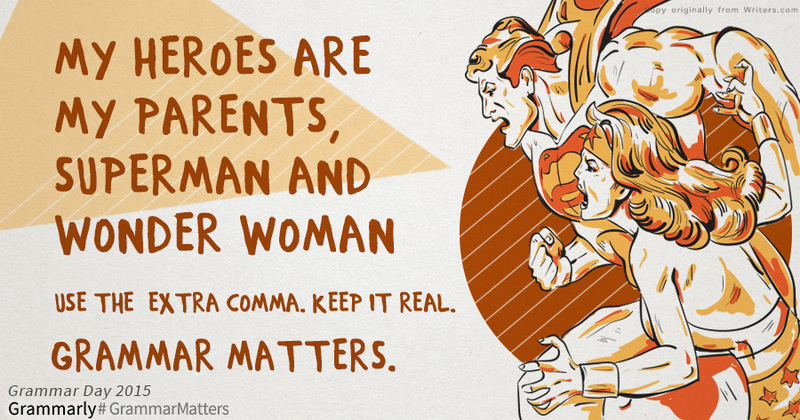 When should (and shouldn’t) we use commas? YES: He owns 2,800 baseball cards. YES: The machine weighs 13, 567 pounds. YES: Mary, you really helped me today. YES: On June 19, 2017, HGR had an Aisle 1 flash sale. But, NOT between the month and year with no day: In June 2017, HGR had a flash sale. YES: He is from Atlanta, Georgia, but moved to Cleveland, Ohio, when he graduated from high school. Simple series: He likes welding, machining and woodworking. Comma needed before last item since it all belongs together: For lunch she likes to eat salad, soup, and peanut butter and jelly sandwiches. Semicolons needed because there are commas within some items in the series: On weekends, I do my chores; sleep in; read books, the newspaper and Facebook posts; and go shopping. YES: He is a smart, kind child OR He is a kind, smart child. NO: We stayed at an expensive summer resort because you couldn’t say, We stayed at a summer expensive resort. YES: Gina, marketing communications specialist, writes great grammar tips. (My title doesn’t matter to understanding the sentence. YES: She came to work, but she went home sick. YES: Are you going to the party, or are you staying home? YES: The dog wanted all my attention, and the cat was jealous. She purchased the car but did not get it rustproofed. Are you mowing the lawn or painting the window frames this weekend? If you are tired, you should take a nap OR You should take a nap if you are tired. Because of the power outage, we went home early OR We went home early because of the power outage. In a compound-complex sentence: Because of the power outage, I went home early, and, because I was tired, I took a nap.